Prevents the easy removal of a tablet from a tablet cradle. The CATM anti-theft / security mount prevents the easy removal of your tablet from a Carcomm tablet cradle. The CATM is placed over the top retainer of the tablet cradle. 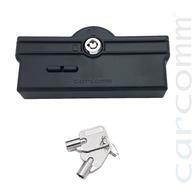 Now you can lock the CATM mount with the included keys and the tablet can't be removed from the tablet cradle anymore.